Carpenter Philip Embury was converted to Methodism on Christmas Day 1752 by John Wesley, who was traveling through west Ireland. Soon afterward Embury convinced his family and neighbors to sail to America. The group landed in New York on August 10, 1760. Embury's aunt, Barbara Heck (sometimes spelled Hick) was described as "a helping hand in every need" to the group of Irish immigrants. But when she found one family playing cards in the fall of 1766, she was horrified. According to Abel Stevens in his 1859 History of Methodism, "seizing the cards she threw them into the fire and, hurrying to the home of Embury, which was in Barrack Street, now Park Place, she told what she had seen and done, and urged him to be no longer silent, but to rise up and preach the word of God." Embury "joyfully" consented to form the first Methodist congregation in American, which consisting of five members. The Palatine Methodists quickly outgrew his house and that same year the group moved into a rented loft in a rigging house on William Street. It would make do for two years before a permanent church was necessary. In 1768 property, 42 feet wide by 60 feet deep,was acquired on John Street, near Nassau and a church building was planned. But erecting a structure would have its hurdles. As John Atkinson pointed out in 1896 in his History of the Origin of the Wesleyan Movement in America, the congregation was "rich in faith but poor in purse." Making things worse was the public prejudice against the Methodists. "The fire of opposition raged tremendously against the rising edifice," wrote Atkinson. The group had 200 pounds for the project; but the cost was estimated at twice that amount. Wealthy merchant William Lupton, contributed liberally, famously saying "The church first, and then my family." Captain Thomas Webb joined the push, adding 30 pounds of his money (Webb would later become a preacher, himself). Because New York laws prohibited dissenters to worship in an established church, a fireplace was built into the new chapel "which gave it the rank of a dwelling," according to Atkinson. The walls were of ballast stone, covered in light blue plaster. Known popularly as "Wesley's Chapel it was officially opened on October 13, 1768; although it would be some time before it was technically finished. During the Revolution the British seized the church, converting it into a theater. According to The New York Times a century later, "Here Major John Andre, Adjutant General of Sir Henry Clinton's army, who was afterward hanged as a spy, trod the mimic stage as Prince Hal." Having regained its building, the congregation worshiped in the unassuming chapel until 1837. On February 1 that year The Herald reported "The property on which the Methodist Church in John street stood is said to be forfeited by the late sale and conversion of it into stores." The construction of a new edifice was completed in 1841, an especially handsome Anglo-Italianate structure that featured tall arched openings flanking a Palladian window above the entrance. The classic, triangular pediment enframed a half-round opening. In 1855 dissent threatened the Methodists. With the neighborhood rapidly becoming less and less residential, one faction wanted to move uptown and sell the building to be replaced by a commercial structure. Another group wanted to keep the church as a refuge for the needy of the neighborhood. Vintage brass fixtures, now electrified, still line the gallery. On August 16, 1855 The New York Times reported on an attempt at compromise. "This evening the members and congregation of the John-street Methodist Episcopal church meet in the Green-street Church of the same denomination, for the purpose of listening to a history of their Church, and of the difficulties they have had to encounter. We understand that the object in view is to retain the edifice as a house of worship for the use of the poor. The object is certainly to be commended." But things only got worse. Within the year the factions were now tagged by newspapers as the "down-town worshipers" and the "up-towners." On Sunday June 20, 1856 the uptown group paid William Thompson $500 (nearly $15,000 today) to disrupt services. "He accordingly hired fifteen men, well known in Water-street [Manhattan's most infamous center of vice and crime]...and put them in the house." With the notorious men ensconced in the pews, representatives of the group rushed to the mayor. They warned that the John Street Church "had been given over to persons whose character would not stand the test of inquiry," said The Times. Police were sent to the church "to preserve the peace inside the building." The downtown group, in response, entered their own complaint; adding that the uptowners had insulted females congregants. The police, stationed outside to prevent violence, found themselves locked out of the church at 10:00 on the night of July 25. Inside were ten of the thugs hired by the uptown group, and four women and three men of the downtown group--both factions intent on maintaining possession. The New York Daily Times' headline the following day read "The John Street Methodist Church. The Fight Gets Into the Streets." By 10:30 "matters were brought to a crisis," according to the newspaper. Members of both factions crowded the street and a platoon of policemen was sent in. The officers could not reach the doors of the church, prevented by the determined resistance of the angry throng. Violence ensued. "Not succeeding in effecting an entrance, [Constable] Thompson's party drew some sticks and rushed on those holding the door, whereupon the police...ran to the rescue, and by the indiscriminate use of the locust [i.e., nightstick], they drove them off." After the police cleared the church, they found the evidence of the hired men's less than holy activities--"several clubs, and sundry bottles which had once contained schnapps and rot-gut of several qualities and kinds." The Times remarked that "Several policemen were struck, but their fellows amply revenged the wrong." The article concluded saying "The church is now in the hands of the down-town worshipers, and service is announced for Sunday." It appeared that the building, not yet 20 years old, was doomed by the following spring. The uptowners had won a court decision allowing them to sell the property. At the 11th hour, however, hope emerged. The New York Daily Times reported on March 16 that the downtowners, "opposed to the sale of the church, think they see the way out of litigation more and more clearly." They told Judge Davies they has "a reasonable prospect of coming soon into possession of the church funds." The judge issued a temporary restraint against the sale. To celebrate, the downtown faction held "Thanksgiving Services," during which a collection of several hundred dollars was collected for the cause. "The church building was densely crowded," said the article. The downtowners managed to scrape up the necessary money to save the building. It was just the first rescue, however, in what would be a century-long tradition of attempts to raze the church. The John Street Methodist Church congregation was back in court two years later for a much different, if no less surprising reason. In 1852 the first Young Men's Christian Association had been established in New York City. The Association not only provided spiritual guidance and activities for young men, it was active in social reform. The fledgling group operated from a number of rented rooms, one of which was in the John Street Methodist Church. On February 8, 1859 The New York Daily Times noted that "the usual throng in the Marine Court on the first day of term was somewhat increased to-day." The interest was sparked by "an action brought by the John-street Methodist Episcopal Church against the Young Men's Christian Association, to recover rent for the Church building." The suit was, no doubt, viewed by many as somewhat unchristian. One of the congregation's most interesting members was Benjamin F. Weymouth. Born in Portland, Maine, he was descended from a Mayflower pilgrim. Never married, he came to New York in 1853. Active in politics and successful in the grocery and real estate businesses, it was his striking resemblance to Abraham Lincoln that earned him the most attention. Weymouth was repeatedly stopped on the street by pedestrians mistaking him for the politician. And following the president's assassination, according to The Times later, "Weymouth sat several times for pictures and statuettes of the President." A staunch down-towner, Weymouth remained a faithful congregant and trustee of the John-Street Methodist Church even while the neighborhood around it degraded. Following his death on August 10, 1881 at the age of 75, his funeral was held in his beloved church. The Times titled his obituary "President Lincoln's Double." By the time of Benjamin Weymouth's funeral the John Street neighborhood was one of tenements and businesses. In 1877 the John Street Methodist Church turned to a trend that was sweeping the nation--revival meetings. Following the first, The Times reported "The congregation was an ordinary revival or camp-meeting one. There were many young men in the hundred or more present, and many working men, some with sachels and bags of tools under their arms and their work-a-day clothes on." The article was marginally-approving of the less than decorous assemblage. "As the verses of the hymn were sung there was a steady beating of feet in time." One by one speakers rose from the audience to attest to their conversions. "A young man who said he had 12 months ago been a skeptic and a scoffer, avowed himself saved by grace. Another speaker told about two young men who put off their consecration to go to the Brooklyn Theatre, and how both were burned in the fire that destroyed it." Revival meetings would be the mainstay of the church for decades. Particularly notable were the meetings conducted by Revivalist Harrison, the "Boy Preacher," in July 1888. The Times said "Not since the days of Wesley has the old John-Street Methodist Church been so shaken and enlivened with religious enthusiasm." The church's pastor, Rev. Dr. Wellesley W. Bowdish, opened the service on July 14 with a sermon entitled "The Power of the Holy Spirit." Near the end, he became unable to speak. "He threw up his arms and tottered back from the pulpit desk and fell seemingly unconscious into his chair," reported The Times. "There was a great commotion in the congregation and members whispered fears of apoplexy, paralysis, and death." Bowdish was taken to his study and a doctor summoned. He could find no symptoms of a physical disorder. The newspaper was not so quick to attribute the preacher's condition to heavenly causes as was the doctor, who deemed it "the effect of the Divine power." Bowdish recovered and after the meeting confirmed that he had "simply been overcome by the Divine Spirit" and predicted the world would scoff and fail to understand. No matter what the cause of the episode, its resultant publicity was good for attendance and collections. The John Street Methodist Church contained several relics from the congregation's earliest days. On October 28, 1900, following the 132nd anniversary services, Rev. W. C. Blakeman invited the congregation to look at the collection. Included were Philip Embury's Bible, a clock owned by John Wesley, a gavel made in part from wood taken from the old John Street Church, and a vintage oil painting of the original building. As had been the case in 1855, talk of demolishing the church began circulating in 1916. During the Methodist General Conference in May that year the trustees were given permission to replace it with a commercial building. "Skyscraper" churches--office or apartment buildings that included a church--had become a revenue-making device for religious organizations. 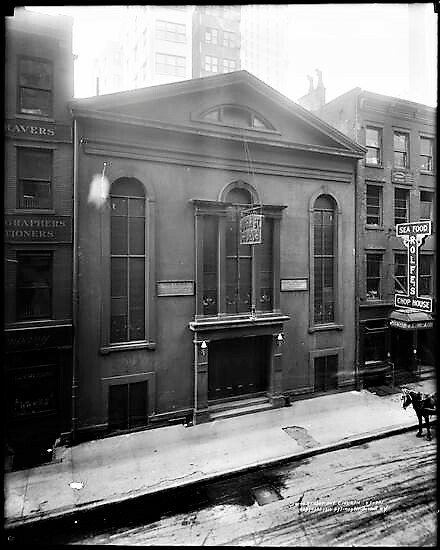 Now, on May 30, The Times reported that "The historic John Street Methodist Church, which stands on the site of the little wooden meeting house built in 1768...will probably be torn down within the next year and replaced with a tall business structure...Tentative plans provide for a church headquarters on one of the lower floors." For whatever reason, the plans were not carried out. But they resurfaced 12 years later. On July 12, 1928 the congregation's lawyer, Carl H. Fowler, announced plans for a skyscraper. Again, the ground floor would contain worship space for the John Street Methodist congregation. 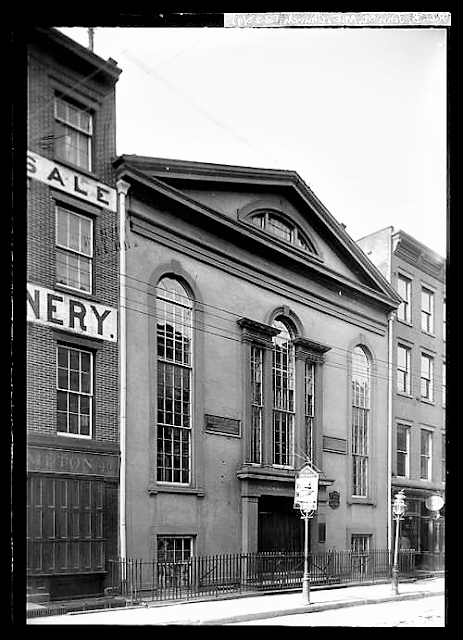 In reporting on the plans, The New York Times mentioned "Tourists from all parts of the world stop at the church on John Street to view the historic spot where Methodism started in the New World." It may have been the onslaught of the Great Depression a year later that temporarily derailed the plans. Nothing had been done by March 19, 1931 when the church acquired two rare 18th century portraits of John Wesley and another of George Whitefield, a early Methodist. "The Charterhouse Boy," was the only extant picture of Wesley as a youth--at about 13 years old. But the trustees seemed bent on the project. Less than six months later, on September 2, 1931 plans by architect Arthur G. Smith were approved. The 19-story "church and office building" was projected to cost between $2 and $3 million. A building committee was selected and a legal team put in place. The Times reported that the interior of the historic church would be reproduced within the ground floors. "It will be impossible to retain the present structure," it noted, "which is ninety years old. The facsimile of the exterior will appear in bas-relief. All of the priceless Methodist relics will be preserved." The building site would include the John Street Trust Fund Building next door at No. 48 John Street. A church spokesman insisted "We want to erect a building as a memorial on the spot where Methodism started." The office tower would "save for posterity" the Methodist shrine. He added that the rentals would provide "many thousands of dollars every year for the support and propagation of Methodism in this city." Once again the church escaped seemingly inevitable demolition; only to be threatened in the summer of 1963 by an engineer's oversight. When foundations were excavated for a neighboring skyscraper, inspectors realized that the church structure was in danger of collapse. Engineers scurried to prop up the walls and foundations before a catastrophe. The church was a target of a bizarre attack on January 21, 1965. At around 11:25 that morning someone walked up the left aisle near the chancel and hurled a dye-filled egg. The inky blue-black fluid smashed on a white wall, dripping down onto the red carpeting. The following day an identical attack took place in St. Paul's Chapel on Broadway, the oldest public building in Manhattan. This time the dye splattered three religious statues. Police suspected the culprit was "a religious crank." The church is dwarfed and enclosed by soaring modern structures. Later that year the John Street Methodist Church was designated an individual New York City landmark. In its report, the Landmarks Preservation Commission remarked "This church is notable for its simple dignity" and pointed out that the building "has remained virtually untouched in the heart of the financial district." With the designation, the venerable John Street Methodist Church was finally protected against the threat of demolition. "Major John Andrew" is actually Major John Andre, who was hanged after being caught leaving his meeting with the traitor Benedict Arnold. Hi, thank you so much for your interest in John Street Methodist! For clarification, Methodists were allowed to continue to worship at Wesley Chapel during the revolution because of their connection to the Church of England. During that period Sunday morning services were not while Trinity and St. Paul’s were holding services because of Wesley’s expectation that the People Called Methodist would be in attendance there. I have read that Hesdian troops held services at the chapel during the revolution. Also, our current building is our third. The original chapel was replaced in 1818, due to age. In the 1830s the city decided to widen John Street in service to fire prevention, necessitating a new building. Why did New York laws forbid dissenters from using established churches? And even if the laws were less than welcoming, why couldn't the dissenters simply build new, smaller churches for themselves? Why pretend to worship in a residential building?